A peaceful gathering took place Monday afternoon in Saxman in support of the Standing Rock Sioux Tribe and to protest the Dakota Access Pipeline. Many expressed concerns beyond what is happening in North Dakota. More than 50 people held protest signs, while about a dozen more watched and joined in on rally cheers. The event initially was organized only to protest the pipeline project, but Organized Village of Saxman President Lee Wallace says it expanded to address local and regional environmental issues. “Our environmental issues are many. There are transboundary issues. Behind Saxman we have Deer Mountain. For our southern brothers and sisters at Standing Rock Sioux, we definitely stand behind them,” said Wallace. A planned section of the Dakota Access Pipeline would cross sacred sites and burial places, and the Sioux Tribe is concerned that, if the pipe ruptured, it would pollute drinking water. Locally, Alaska Mental Health Trust announced that it would log Deer Mountain if a land exchange or other agreement cannot be reached by the end of the year. There are also concerns about the effects of Canadian mining on Alaska fisheries and water quality. Between speakers, the crowd chanted. “Water is life! Water is life! Water is life! Water is life!” chanted protestors. Richard Peterson, President of Tlingit and Haida Central Council, says he’s been asked why Alaskans should be concerned about what is happening in the Dakotas. Peterson says it’s important that indigenous people stick together. “We’re on the very steps of our own battle. I don’t think people are even fully aware of the impacts of what these transboundary mines are doing to our people, to our resources, to our way of life. So we are going to be asking our brothers, our sisters, our allies across the nation, to stand with us before long,” said Peterson. Peterson says Natives and non-Natives need to work together to protect the land and waters. “Standing with Standing Rock! Standing with Standing Rock! Standing with Standing Rock!” chanted Peterson. Rob Sanderson, 1st Vice President of the Tlingit and Haida Central Council, shared his concerns about transboundary mining. “It’s not the big events that will happen. In Southeast Alaska, as I have learned, it’s the smaller events that come from these mines that will hurt us. The Tulsequah Chief (mine), poison since 1957 when they closed it down. Still leaching acid-generated tailings today,” said Sanderson. Sanderson encouraged people to educate themselves and do their own research about local environmental issues. Fred Olson, vice president of the Organized Village of Kasaan read a resolution adopted by the Kasaan tribal council in opposition to the Dakota Access Pipeline. “And whereas the Missouri River tribes rely on the waters of the life-giving Missouri River for their continued existence. And the Dakota Access Pipeline poses a serious risk to the very survival of the Missouri River tribes,” said Olson. 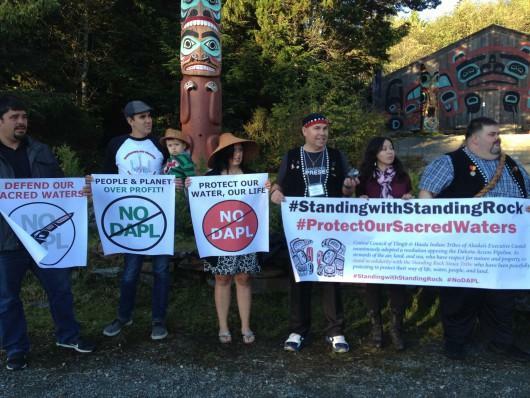 Many at the rally were in Ketchikan attending the Southeast Tribal Environmental Conference. Tony Chrisiansen of Hydaburg says events like the conference and rally help increase awareness of issues and open dialogue. He says it’s important to continue discussions and come up with solutions. “Find an arena for dialogue, then we can find ourselves dealing with the issue face to face and hopefully get something constructive out of it. That saves our water and saves the quality of life for our people in Southeast and abroad,” said Chrisiansen. Richard Jackson of Ketchikan Indian Community says it’s important to fight for, and stand behind, the things you believe in. “So when you do these things like ‘Stand With Standing Rock,’ ‘Stand With Deer Mountain,’ ‘Stand With What We Value for Health and Wellness,’ then we can look at ourselves and say ‘We did the best we can.’ It’s only the person who stands back and says nothing who should be very ashamed of themselves for not doing anything,” said Jackson. Monday’s rally outside the Saxman Tribal House was arranged on short notice. The group plans to hold a larger rally next week in downtown Ketchikan.